The twelve Heavenly Star qi-points of Ma Dan Yang, who was a famous Daoist practitioner of traditional Chinese medicine, around 1140 A.D. 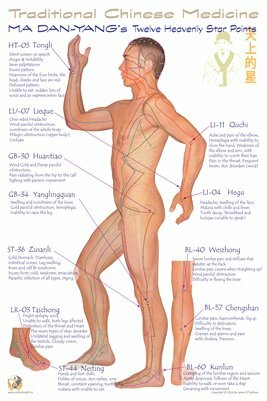 These are his famous chosen Qi-points as recorded in his ode to 11 miraculous acupuncture points, which was published in the Jade Dragon Manual in 1329. the twelfth Qi-point LR-03 was added by Xu Feng who introduced the Eight Extraordinary Vessels. These excellent, important and powerful points should always be considered when diagnosing and choosing your point prescription.